As part of the Edinburgh Festival of Cycling on Tour, we are pleased to present the Summer Fun Day (Glasgow), in association with Bike for Good. Want to start cycling or cycle more but don’t know how? 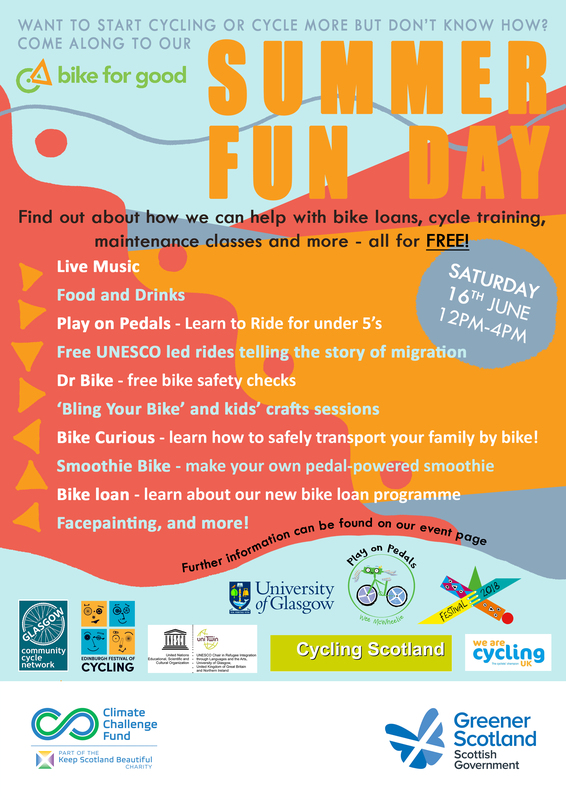 Come along to our Summer Fun Day to find out about how we can help, with bike loans, cycle training, maintenance classes and more – all for FREE! Bike Curious – learn how to safely transport your family by bike! UNESCO will also be running led rides as part of Refugee Week, going on a tour of Glasgow looking at different aspects of a Refugee’s journey. Please sign up in advance here.